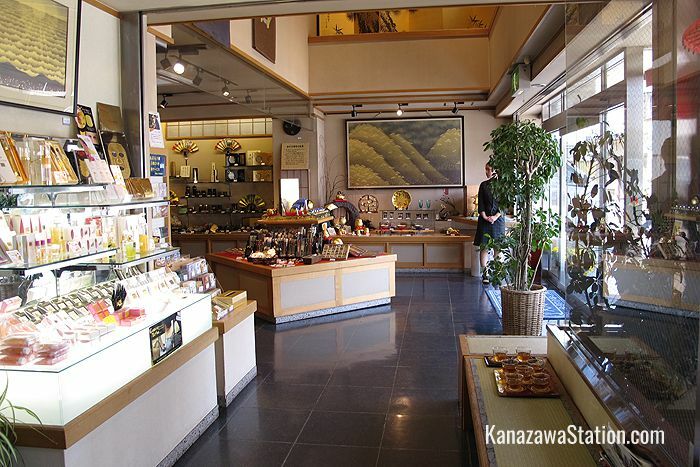 Gold leaf production in Kanazawa dates back 400 years and today is one the city’s many flourishing traditional crafts with gold leaf decorated goods featuring heavily in the city’s souvenir stores. One of the most popular specialty gold leaf stores is Gold Leaf Sakuda. This company has many branches in Kanazawa, but the main store in the Higashi Chaya-gai district is particularly worth visiting. Here you can take a tour of the factory, view the production process, and even try some gold leaf decoration yourself. The story of Kanazawa gold leaf begins in 1583 at an important point in the city’s history. That was the year that Lord Toshiie Maeda, the first ruler of the local Kaga clan, rode into the city and established himself at Kanazawa Castle. That same year he ordered the first production of gold and silver leaf. This was part of a wider push by the Maeda family to encourage the development of arts and crafts in Kanazawa which resulted in the city becoming one of Japan’s leading centers of culture. 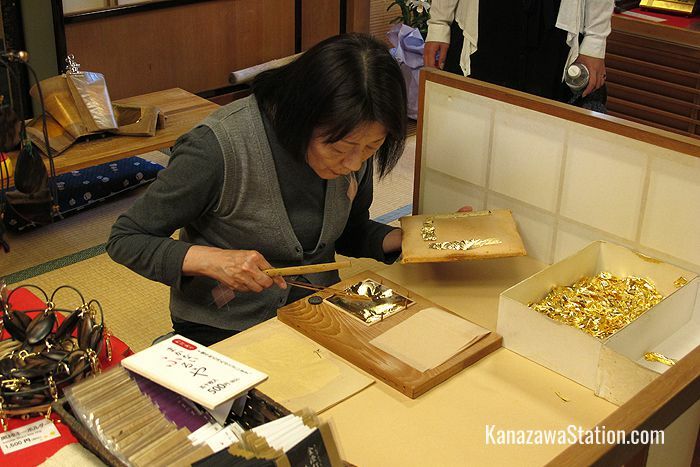 Traditional handicrafts still flourish today in Kanazawa and among them perhaps nothing better expresses the local pride in workmanship and artistry than the use of gold leaf. Gold leaf is used to decorate folding screens, lacquerware, ceramics, glassware, sculptures, calligraphy and Noh drama costumes. It is also essential for decorating temples, shrines, and Buddhist altars. Gold leaf is so thin and delicate when it is produced that even a tiny amount of static electricity can tear it. This makes the humid climate of Kanazawa and also the purity of the local water supply uniquely suited to its production. For this reason 99% of the gold leaf produced in Japan today is made in Kanazawa. 100% of the silver leaf and platinum leaf is also made here. Collectively called “Kanazawa haku” it is a nationally designated traditional handicraft. The Sakuda company was founded in 1919 as a gold leaf wholesaler, but began producing its own decorated crafts in 1970. 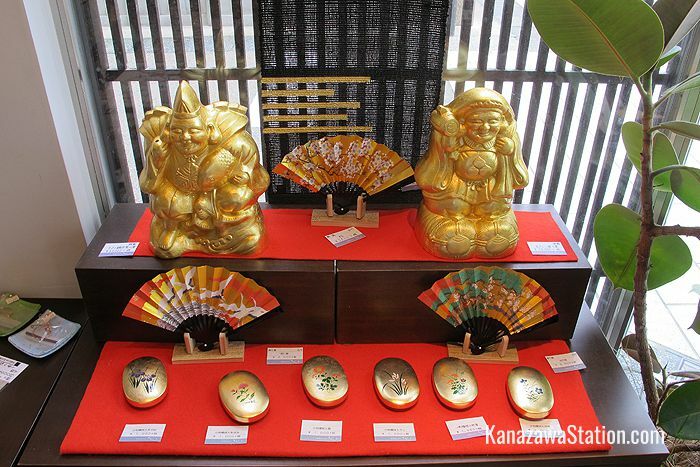 Today it is one of Kanazawa’s most popular brands of gold leaf decorated goods. At their main store you can buy a variety of decorated ornaments, accessories, and ceramics and lacquerware. You can also enjoy a cup of tea with flecks of gold in it! In addition the store features a gold leaf mini-museum, and gives tours of the factory area so you can view the gold leaf manufacturing process. If you want to try decorating some simple objects with gold yourself, such as chopsticks, dishes, or jewelry boxes, you can do so in their hands-on workshops. Before you leave be sure to check out the store’s super gorgeous restrooms with walls covered in gold and platinum foil. There are four decorating workshops each day which last for 60 minutes each. These begin at 9.00, 10.30, 13.00, and 15.00. The cost varies depending on the object you decide to decorate. Decorating a pair of chopsticks with gold leaf will cost just 600 yen. For a wooden pendant the price is 3,400 yen. It is possible to walk in and join a session without booking, but this activity is popular so it is wise to book in advance. You can do so using the contact page on the official Sakuda website. There are two branches of Gold Leaf Sakuda in the Higashi Chaya District. 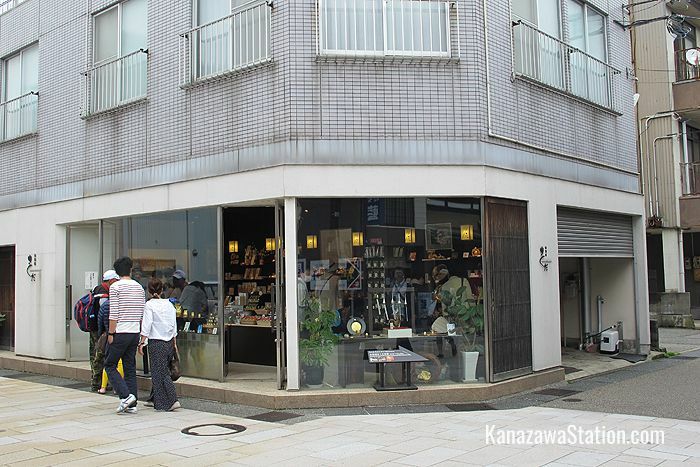 The Chaya District Store is a relatively small show room selling gold leaf products. You can find this store fairly easily in the main walking area. 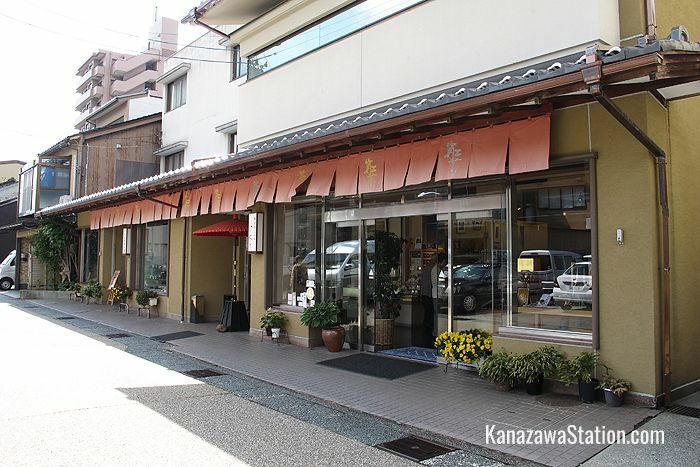 The Gold Leaf Sakuda Main Store is 100 meters to the north of the Chaya District Store. This is where you can view the manufacturing process and try your hand at a workshop. To get to the Higashi Chaya-gai district from Kanazawa Station take a Kanazawa Loop Bus to the Hashibacho bus stop. The bus takes 7 minutes and costs 200 yen. From Hashibacho bus stop, the Higashi Chaya-gai area is a 5 minute walk. Here is a map for both stores. Both stores are open from 9.00 – 18.00.